Dominic K.F. 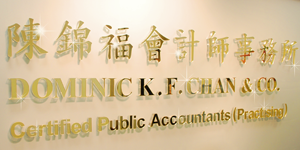 Chan & Co. is a firm of dedicated and professional Certified Public Accountants. We offer a wide range of services to cater to the needs of both local and international businesses. Our services include audit and accounting services, taxation, risk assessment services, corporate finance consultancy and business advisory services. Over the years, we have developed an excellent and expansive clientele. Our clients' support has allowed our firm to enjoy continual growth, and as such, we have expanded our international business practices in order to better serve our existing clients and to respond to demands for our firm's services. We are committed to, and value our integrity and objectivity. According to the Sarbanes-Oxley Act 2002, only the accounting firms registered with the *PCAOB (“Public Company Accounting Oversight Board”) are eligible to prepare financial statements or issue audit reports on U.S. public companies or participate in such audits. Since 2006, we have been registered with the Board and credentialed to practice before SEC (‘the U.S. Securities and Exchange Commission), and have been engaged by US-listed Hong Kong companies and PRC enterprises for audit assignments.